The work of Cape Town born self-taught artist, Andrew Cooper could best be described as a blend of semi-realism and mysticism. The bold use of colour, capturing the subtle nuances of light, depth of perspective and generous scale are all hallmarks of his paintings imbued with a mood & atmosphere of his own. He paints from memory and his own photographs, rather than in situ and his aim is to capture the essence of the scene in his unique style. Through the rendering of fine detail, rich colour and expansive vistas, the viewer is transported into the scene itself. His mystical range of paintings spring from his imagination and represent nature, mythology and the often hidden spiritual side of life. Apart from a few childhood years spent living in Scotland & England, Andrew has always called Cape Town his home. He has been painting professionally since 1987 initially working & exhibiting in watercolours for 9 years before making the transition to acrylics. 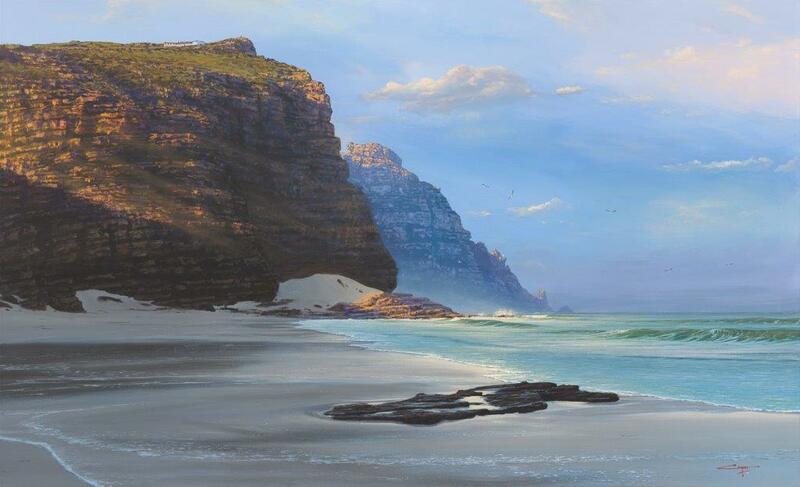 With some of the world's most beautiful natural scenery on his doorstep, it's no surprise that the subject matter that underpins the majority of his art is the mountains, beaches, rivers, semi-desert, winelands and farmlands of the Western Cape. Andrew's paintings reflect his temperament-grounded and humble; he approaches both his subject matter and the viewer in a sincere, unpretentious way. When he is not behind his easel, you might find him exploring outdoors fly-fishing rod in hand….he's also been known to enjoy a good Scotch.